The manufacturers of model kits have focused on reproducing famous ships and even entire fleets at different scales from 1/700 to 1/350, and more recently 1/2000. However, the remote control model ships variety is also increasing recently. Simultaneously, the RC model ships prices are becoming more affordable. Here, we selected some of the RC model ships for sale and write down the main features and images. We hope this can inspire your future hobby time. USS Missouri (BB-63) is a United States Navy Iowa-class battleship and was the third ship of the U.S. Navy to be named in honor of the U.S. state of Missouri. Missouri was the last battleship commissioned by the United States and was best remembered as the site of the surrender of the Empire of Japan, which ended World War II. On September 2, 1945, General Douglas MacArthur accepted Japan’s surrender on the deck of the USS Missouri in Tokyo Bay. Missouri received a total of 11 battle stars for service in World War II, Korea, and the Persian Gulf, and was finally decommissioned on 31 March 1992. In 1998, she was donated to the USS Missouri Memorial Association and became a museum ship at Pearl Harbor. 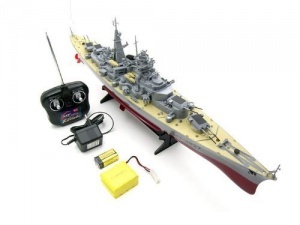 This Ready-To-Run replica model boat is highly detailed Deck Superstructure. Full of different size guns & rocket launchers toy figure stay on the deck, included a helicopter action model. Perfect for display or sailing in pools, small ponds, rivers and lakes. Full Function Radio Controlled Forward, Reverse, Turn Left & Turn Right Dual Propellers High quality High Performance 6.0v rechargeable battery With light Detailed Interior & Exterior Glossy Exterior Paint Easy to Assemble Speed: 5-10 mph Controlled Range 60 feet Scale: 1:52 Factory assumable Ready to Run Package Includes: 6.0v Nickel-Cadmium Rechargeable Battery. Battery Charger Adapter (110V) One Controller. One 9V battery for the controller. USS Wasp (LHD-1) is a U.S. Navy multipurpose amphibious assault ship. She is the lead ship of her class. The Wasp class is a class of Landing Helicopter Dock (LHD) amphibious assault ships. The Wasp class is based on the preceding Tarawa-class design. The design was modified to allow for the operation of AV-8B Harrier II aircraft and Landing Craft Air Cushion (LCAC) hovercraft, making the Wasp class the first ships specifically designed to operate these. She also accommodates the full range of Navy and Marine Corps helicopters, the tiltrotor MV-22 Osprey, conventional landing craft, and amphibious vehicles.